I was afraid of the dark when I was young. We lived in a rural area and we could hear clearly everything around us. If we heard people crying from a house we knew there was a death in their family. When I learned to recite, "Namo Amitabha Buddha," I felt that I was receiving the Buddha's protection and was no longer afraid and not fearful of the dark. 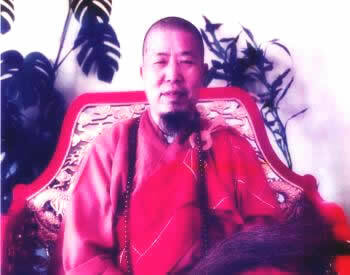 The Venerable Master Hua led a delegation to propagate Dharma in Malaysia in 1979 where I took refuge with him. The Butterworth Buddhist Association then invited the Venerable Master to propagate Dharma in Butterworth so I became actively involved in the activities at Butterworth Buddhist Association. I joined the Association's recitation-assistance group and recited for the Association's family members and relatives. From that experience, I felt that reciting "Namo Amitabha Buddha" was excellent because I was able to protect myself and to help others - benefiting oneself and others. One day I participated in reciting the Buddha's name in three different places. The first place was in Butterworth, not far from my home. The second was in Penang which required a boat ride. I got home at 10:00 p.m. and received a phone call to travel to the rural area of Sungai Petani to assist in the third recitation. The rural area could only be reached after a few hours of driving. I got home at 1:00 a.m. One family was extremely wealthy, the second was a political celebrity and the last one was a very poor family. I gained a deep realization that - regardless of how much wealth and power one has accumulated or how many industrial enterprises one has built, or whether one is indigent and penniless - one ultimately has to die. The Venerable Master said, "In thought after thought, never forget about the sufferings of birth and death; in wish after wish, always think about liberation from the wheel of transmigration." He also stated, "If one does not want to die, then one must apply efforts on death." What does it mean, "… apply efforts on death"? It means to always be mindful of the Buddha, to prepare early for the three provisions of faith, vows, and practice so that one will be reborn in the Western Land of Ultimate Bliss. On one occasion we were informed that our recitation assistance assignment was to recite the Buddha's name for a "patient", so that he could be reborn quickly. This was unlike a situation in the Earth Store Sutra in which one who is "unable to die" undergoes a great deal of sufferings. This place was more frightening than all the other places where we had assistance recitation. It was in the home of a wealthy family. The sight of the patient made us feel terror because his family had placed a funeral hat on his head and had dressed him in funeral clothes. The patient's body was already emitting foul odor. He was not willing to die. Why? Because he had so much wealth that he couldn't let go. Yet there was something that angered him more. Soon after he became ill - and definitely not dead yet - his sons and daughters began to fight and squabble over their inheritance. They were brawling and exchanging blows in his presence. During one of the brawls, one of them threw a fan intended for another sibling and it hit him in the face, which angered him even more. Before we began to recite the Buddha's name, one of our overzealous members whispered in his ears, "Go quickly! Don't linger and hang around this world any longer. This world is full of sufferings…" As she was in the middle of speaking to him, the patient, being on the verge of death and unable to speak, became so angry that he let out a cry, "Ah! Ah! Ah!" We were so frightened that we wanted to run away. Would he get up and try to hit us? It was horrifying. We immediately dissuaded our Dharma friend, "Let it go! Don't talk anymore. Let's just recite the Buddha's name." 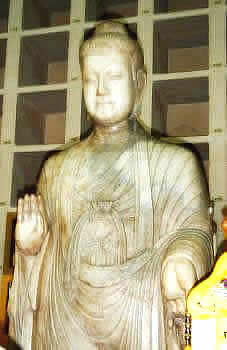 Fortunately he gradually calmed down in the midst of our sincere recitation of the Buddha's name. We left his home. We recited a full day; there was no response. We continued to recite a second day and a third. We heard that he eventually let go and died. I sincerely hope that he was able to put down everything and was reborn in the Western Land of Ultimate Bliss. When one recites, "Namo Amitabha Buddha," it is bringing accomplishment, realization, adornment and achievement to one's own Land of Ultimate Bliss. The Land of Ultimate Bliss is ten thousand billion Buddhalands away, yet it is not beyond one thought in the present mind. 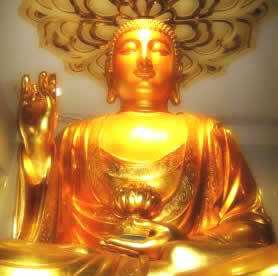 And because it is not beyond one thought in the present mind, it is not really ten thousand billion Buddhalands away. It is actually in our own mind. This Land of Ultimate Bliss is the true body of you, me, and all living beings. If you have attained the inherent true body, then you are within the Land of Ultimate Bliss. If you have not realized your inherent true body, then you have not been reborn to the Land of Ultimate Bliss. 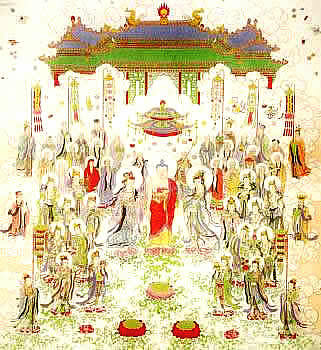 Amitabha Buddha and us, the living beings, are not apart from each other, so the Land of Ultimate Bliss is not so far away. If we can, within one thought, return the light back to ourselves, then we would understand that inherently we are the Buddhas and the Buddhas are also the Lands of Ultimate Bliss. If we eliminate our own laziness, desires and other defiling thoughts and can be free of the jealous mind, the obstructive mind and the self-profiting and self-benefiting mind, then we can singlemindedly seek to learn from the Bodhisattvas how to benefit others and how to awaken and enlighten all living beings. This is the manisfestation of the Land of Ultimate Bliss. We would no longer need to seek for anything outside. As we are here reciting, "Namo Amitabha Buddha," in the Western Land of Ultimate Bliss, there will be lotus flowers growing in the Seven-Jeweled Pool's Water of Merit and Virtue. The more we recite the Buddha's name, the larger the lotus flower grows. Yet the lotus flower is not yet blossoming. When we die, our inherent nature will be reborn in the lotus flower of the Land of Ultimate Bliss. The grade of our lotus flower - whether the upper grade upper rebirth, middle grade middle rebirth or lower grade lower rebirth - is dependent on the amount of our recitation of the Buddha's name. If we recite often, then our lotus flower will be larger; if we recite little then our lotus flower is small. If we stop recitations altogether and no longer want to go to the Land of Ultimate Bliss, our lotus flower will wither and die. It is entirely dependent on how much effort we apply in earning the grade of rebirth. I know that my lotus flower is tiny because I work too much and don't often recite the Buddha's name. I must devote more time on reciting the Buddha's name.